FROM THE PUBLISHER: The first book in a thrilling fantasy trilogy starring one of the animal kingdom’s most hunted heroes. Foxcraft is full of excitement and heart, and a touch of magic. Isla and her brother are two young foxes living just outside the lands of the furless — humans. The life of a fox is filled with dangers, but Isla has begun to learn mysterious skills meant to help her survive. Then the unthinkable happens. Returning to her den, Isla finds it set ablaze and surrounded by strange foxes, and her family is nowhere in sight. Forced to flee, she escapes into the cold, gray world of the furless. Now Isla must navigate this bewildering and deadly terrain, all while being hunted by a ruthless enemy. In order to survive, she will need to master the ancient arts of her kind — magical gifts of cunning known only to foxes. She must unravel the secrets of Foxcraft. REVIEW: A fox, Isla, returns to her home one day to find it destroyed and her family missing. So she goes in search of them. To find them she will have to gain new magical abilities (Foxcraft). 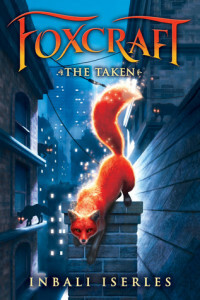 While this is a pretty straight forward premise, this story diverges from the expected by placing the world of the magical foxes firmly in contemporary human society (think muggles). This isn’t just about fantastical creatures who live in a fantasy setting and I appreciated that. Personally, I found the book to be a little slow at times and ended up skimming some chapters to get to better ones later on. By the end, there was a satisfying set up for the next book in the series. I found it a fun, interesting, easy fantasy read. But I’m not the target audience. Here’s what my 12 year old daughter thought: “This book is absolutely amazing! It’s so full of adventure and mystery. I really loved the idea of foxes and how the story was laid out. I enjoyed the interactions between the characters and how they acted differently towards each other. I think everybody will enjoy this book a lot for those reasons! And many many more!” So satisfied target audience: achieved. Sunshine is a 12 year old avid book reader who we love to ask what she thought of the books she reads so we can share a young reader’s perspective with you!